New Delhi : Congress vice president Rahul Gandhi arrived in Ayodhya on Friday, he visited Hanuman Garhi temple in Ayodhya as part of his ‘Kisan yatra’. Gandhi marked the first visit by a Nehru Gandhi family member since the demolition of Babri Masjid in year 1992. 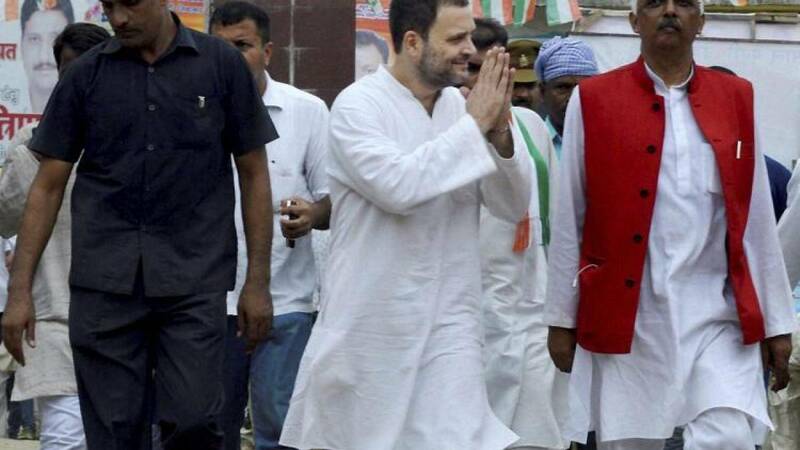 # Rahul Gandhi’s Ayodhya visit has revived the legacy of his father Rajiv Gandhi. He is the first member of his family to visit Ayodhya since the demolition of 16th century Babri Masjid. #Rahul’s father and former Prime minister Rajiv Gandhi, during his ‘Sadbhavna Yatra’ in 1990, was scheduled to visit Hanuman Garhi temple, but could not make it due to his busy schedule. # Rahul Gandhi will also visit Kichaucha Sharif Dargah in neighbouring Ambedkar Nagar district in order to balance his yatra. # Amethi MP will hold a road show in Faizabad on Friday. #After his brief visit to Hanuman Garhi temple, Rahul started his road show and concluded his Kisan yatra with a visit to the Kichaucha Sharif Dargah in the adjoining Ambedkar Nagar.